We are in the final stages of putting together our river drifter. It’s our plan to use this drifter to show the path that trash takes from the urban areas of Los Angeles County out to the ocean. 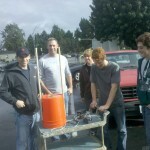 The drifter is a hybrid utilizing both the Amateur Radio APRS (http://www.aprs.org ) tracker and Jim Manning’s NOAA satellite tracker. I’ve pasted a description email below. I brought the unit in out of the window on Wednesday night and put it into inventory then configure. Hopefully I shut it down properly. I did a bit of research looking for handheld gps units to put in with it and after reading specs, realized that if we run it until the battery dies, that we will likely loose all the saved tracks. We started talking about putting in a battery pack instead of ballast to power the gps until the unit was recovered. 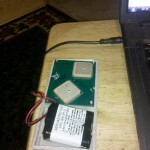 At that point, I brought out my ham radio/gps trackers that use the ham APRS service. We did some testing yesterday and have a unit about set up and ready to go. 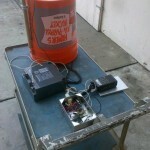 It will transmit to the ham network once every 60 seconds and will last about 4 days on the battery we have. The satellite tracker can then be dialed down to give less frequent reports and if it makes it out of the harbor, we’ll let it go for a week or so. The recovery plan is if close by, to go out and get it; if it makes it to the open ocean, hope that it is recovered and contact made with us. The ham electronics module (APRS) will be sealed inside two 1/4″ thick acrylic domes today and then foamed into the bottom (top) of a bright orange Home Depot bucket. The APRS needs a 2m quarter wave antenna, so I got two 18″ bright orange safety flags with wood poles. We used the pole to run the antenna up under the flag. The antenna ground plane is a wire along the top rim and a second wire dropping down into the water. The antenna works great and we are able to hear lots of network stations and able to get into the network also. On the APRS tracker we were having problems getting it to transmit, so I disabled the “Send only Valid Positions” mode for testing and the last transmission before we shut down shows this unit way up in Canada. I’ll turn that mode back on today to keep that from happening when live. We found out that we had a flaky GPS unit and the replacement is working fine. The problem with this service is that once the unit is beyond line of sight communication, it goes dark and we loose it. That’s where the satellite unit would pick up and take over, so this gets us the best of both worlds. High rate live reports while in the urban areas running down the river and then low rate tracking once it settles out in the ocean. This is the disassembled APRS electronics. 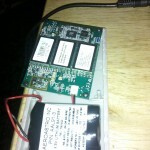 A battery, GPS receiver, a TinyTrakII controller and a 2 meter hand held transceiver. It was a frustrating day of testing with some success in testing and lots of problems. It turns out that our 11 year old GPS unit does not function well in cloud cover and rain. It took some time but we finally correlated the lock periods with times when the sun was out. At one point there was an awesome double full rainbow on the horizon, but our day was not so awesome. I’ve ordered a Parallax GPS board that has the sensitivity needed and we’ll swap that our with our “ancient” receiver. I also had some problems with our second satellite unit not responding to the configuration program. After numerous trys with and without a passkey I figured that the battery might be dead. Rather than sending it back to Jim for a replacement, I surgically opened up the case and started checking it out. The battery voltage was OK at 4.63volts. So I unplugged the battery and let the unit sit for a minute unpowered. After plugging the battery back in, I tried connecting to it without a passkey. It woke up on the second try – YEA! I set the passkey and was able to take it in and out of operational mode. Looks like this one is back from the dead. In doing this I found out that the battery pack is a non-rechargable three AA lithium pack from Energizer. It has a capacity of about 3000mA hours. This started me thinking. I found a solar cell phone charger on Ebay for about $12 (including shipping) that has a 2600mA hour battery pack. The output voltage is the same as the satellite unit pack. 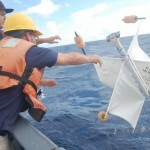 I’m thinking that on our drifter, I could put the solar cell on the top and connect it to the unit. It could power the unit for quite a while. 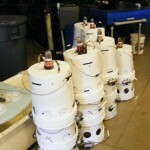 I’ve uploaded some photos of the unit’s insides. It was a bright and sunny day today, no rain! Dropped by school to see if the GPS unit would establish lock. It finally did after 10 minutes. Nothing like 12+ year old technology. I found a 1997 date code on one of the devices. Took the drifter for a stroll around campus and was able to record a number of locations over APRS, but it was still spotty. As soon as the clouds started rolling in, it had a hard time maintaining lock. So…. with all that in mind. I ordered the Parallax GPS data logger kit. We will now have three ways of recording locations. 3. Using the satellite transceiver, a position will be sent out once per hour. We’ll have the satellite transceiver connected to the solar charged battery pack. Now check my math here. Jim tells me that the batteries are good for about 1000 transmissions. Sending one per hour, gives about 41 days per battery pack. But it may try as many as three times to make a connection so worst case is that the pack would last for about 14 days. So our worst case is that we use 1/14 of the battery pack per day and best case 1/40. It looks like a charge time of 0.6 to 1.7 hours per day will be needed to maintain the battery pack. The solar cell on the pack will charge the entire pack in 15 hours of sunlight. This is the entire pack. All I’m asking is a 1/14 pack charge over the day. That’s it for now. With these changes, we won’t make it in time for this rain storm, but there will be more down the road. Scott, this is a very exciting and novel approach for using the drifter. 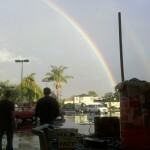 It is also very timely with all the rain and floods taking place in Southern California. Keep us posted!